Have you come across business content that confuses you, or makes you work too hard to figure out exactly what the person does and for who? My guess is yes, of course. We all do. That’s probably because there is no clear niche. So everything feels sort of generic and wishy-washy. When that happens, most of us decide to move on. As a business owner, that is bad news. Introverted women building online service-based businesses will reach out to me because they are struggling to find clients, despite their commitment and effort. Frustration and doubt are starting to take a toll and they know that something needs to change. They usually think it’s about social media strategy or starting to pay for Facebook ads and the like. But when I look at their websites and content, I’ll see different topics directed at different client groups with no real clarity about how it all fits together or what problem is being solved. The language doesn’t really connect. Nothing really stands out. 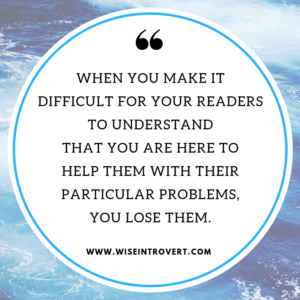 When you make it difficult for your readers to understand that you are here to help THEM with their particular problems, you lose them. When they can’t easily understand, “What’s in it for me?”, they move on to the next option, causing you to spend more energy to keep trying to find a buyer. It’s exhausting. And it’s impossible for an introvert to sustain a business this way. Here’s what I think happens. As a business owner, you have a lot of ideas for how you can help people and you haven’t really honed in on the main client group you want to target. You don’t want to leave anyone out. And you believe that drawing from a larger audience will make it easier to fill your offers. What this really means is that, as an introvert, your precious energy and focus is scattered with a sort of shiny object syndrome. Here’s the thing. Especially for introverts who really do NOT want to do the group networking thing, focusing your energy on addressing one problem for particular people who share that problem makes life easier. We’ve had a really hot and dry summer here in BC so our town has implemented significant water restrictions. On our watering days, my hubby goes out with the hose and sprays down all the garden beds. Alternatively, I go around with a bucket of water and focus on soaking the potted plants. Which ones do you think look healthier today? The garden beds that were given a spray with the hose survived (after he stood out there for an hour each time), but the pots are flourishing (after I took about 5 minutes each time). And I think that’s what we introverts need to do in our businesses too. Selectively and strategically focus our energy and attention on ONE thing that will thrive, versus MANY things that simply survive. Not only will that save us energy, but momentum will build as you start seeing results for your efforts which will help to fuel you. That doesn’t mean you can’t serve others or get creative with your offers. It just means that you are going to choose one specific problem to help a particular type of person with first and focus on them for the next three months minimum (it should be longer but that idea might send you into a panic and you’ll resist choosing a niche at all!). Honing in on a niche is not a lifelong commitment…I also have a tendency to stick to something for two years max and always have new ideas. But trust me when I tell you that, if you are having trouble finding enough clients, it is well worth it to put your blinders on to all the distractions and possibilities for a while. If you value simplicity and minimalism in your life, this is the approach I want you to apply to your business. When you commit to more niche clarity, you can then easily brainstorm all the ways that you can get in front of these people that do NOT require you to go to generic networking events. That’s good news! I’m happy to talk through this with you as you clarify the target niche for your specific service-based online business. It’s part of what I do in my laser coaching/consulting sessions. Sending positive energy your way fellow introvert solopreneur…you can do this!